Disparate approaches for desperate times at Studio Quercus and Kala Gallery. In the classic Powell/Pressburger film I Know Where I'm Going an overly serious young Englishwoman remarks about an Irish local, "Little odd, isn't he?" "Who isn't?" replies her companion, an impoverished laird familiar with highfalutin London ways. 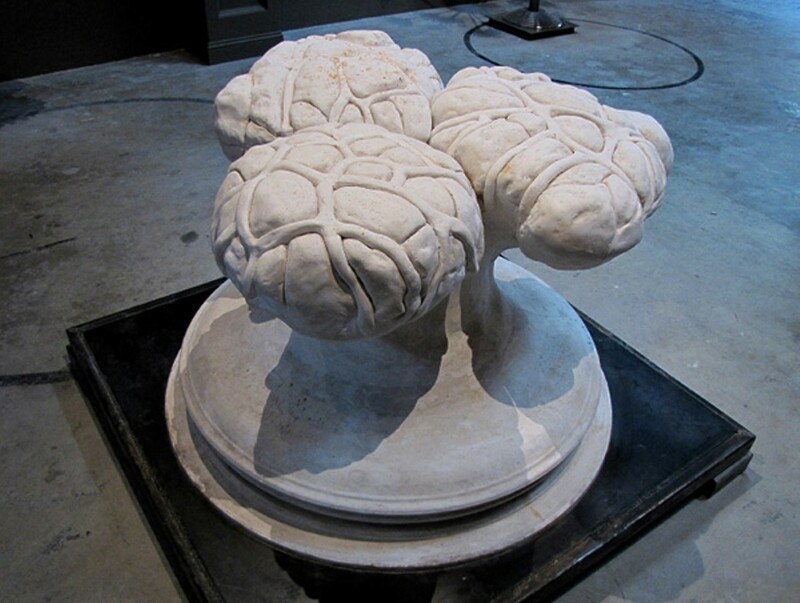 Kyle Milligan's sculptures in his provocatively entitled solo show, Yeast Piss & Poppy Sap, display a similar insouciant eccentricity, combined with a mastery of traditional sculptural techniques. The resulting works are, in the press release's words, "whimsical, physical, intricate, and heavy," combining "the mashing together of unexpected shapes ... the humorous characterization of body parts ... [and] names ... plucked from medical manuals," which Milligan, who studied and practiced traditional Chinese medicine, finds funny. "Steatopygia," or fat buttocks, and "Rosacea," named after a skin rash, feature bouquets of fleshy floral or coral orifices mounted atop columnar or table-legged stands (as does the non-medically entitled "Orange Pop"). "Galactoblast II," a faux-marble trio of mushrooms crisscrossed by strings or veins, is based on the milk glands of the human breast. Other pieces have more conversational but equally eccentric titles, e.g., "Perverted," "Never Rename a Piece," "This Is Not a Love Song," and "What About My Dignity, Dammit!" Milligan: "These pieces are songs, unspoiled by lyrics you have to figure out. Their names are fun band names. People have been beat up by art. I don't feel you need to have an art degree to look at art, any more than you need a music degree to listen to the Beatles." Check out Milligan's studio behind the gallery, where "Schistosoma in Copula" and "Borborygmus," among others, await. Yeast Piss & Poppy Sap runs through December 17 at Studio Quercus (385 26th St., Oakland), 510-452-4670 or StudioQuercus.com. Cashing Out, a group show of 22 artists or artist teams, too many to list in full here, explores the Great Recession through a variety of approaches. These include the straightforward photographic portraits of the homeless/underhoused by Stephen Chalmers, works that hark back to the WPA documentary work of Dorothea Lange and others (and are as timely as Occupy Oakland), and satirical or conceptual pieces on money (by Lauren DiCioccio, Dan Tague), housing (Geraldine Lozano, Zach Moser), shopping (Art for a Democratic Society, Bazuco Media Corp., Kathryn Clark, Torreya Cummings, Kelly Lynn Jones), and, of course, the military-petroleum complex (Walter Robinson). New paradigm, buddy? Cashing Out runs through December 3 at Kala Gallery (2990 San Pablo Ave., Berkeley). 510-841-7000 or Kala.org.